It is a rotation of the lower leg bone (tibia) excessively inwards relative to the upper leg bone (femur). It may also be due to an internal twist of the lower portion of the lower leg bone (tibia) relative to the upper portion of the lower leg bone (tibia). Usually noticed between the ages of 2 and 4. It is the most common cause of in toe in the 2 to 4-year-old age group and the condition usually resolves by age 8. Excessive medial ligamentous and muscular tightness around the knee region. Sitting and sleeping postures may perpetuate the problems but generally do not cause them. When viewing the child standing, the foot and lower leg appear to be rotated internally. If there is an isolated problem, the kneecaps appear to be straight, thus distinguishing this condition from femoral anteversion in which the kneecaps are pointed in. When walking or running the feet excessively turn in occasionally causing tripping and falling. During running the kneecaps continue to stay straight. At the end of the day when fatigue sets in the in toe appear to be worse. Maybe asymmetrical (one side worse than the other). May appear to be bowlegged (because the musculature in the calf is rotated towards the outside of the lower leg). Could be associated with metatarsus adductus in an infant. Examining the child with the patient sitting, standing and walking is important. When the child is sitting the rotation of the lower leg bone is measured against the upper leg bone. 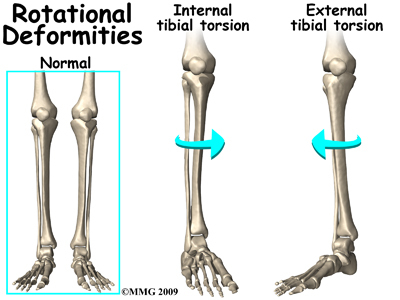 When the rotation of the lower leg bone is excessively in with very little rotation out, this is indicative of internal tibial torsion. Observation of the kneecaps is important in helping to rule out femoral anteversion or to determine if there is a component of a hip problem associated with it. Observation of gait and reassurance to the parents that the condition usually resolves by age 8 is provided. Abnormal sitting and sleeping postures which tend to perpetuate the deformity need to be changed. A child that is tripping and falling or has a posture that is excessively turning in will benefit from a cast that goes above the knee. During the cast application, the lower leg bone is gently rotated externally relative to the upper leg bone. This helps to stretch the ligamentous and musculotendinous structures around the knee. The cast may be utilized for 2-6 weeks. This will rapidly help the normal physiologic unwinding process of the lower leg bone relative to the upper leg bone. Night splinting is utilized following cast removal to maintain the correction. Counter rotational splints and a Denis Browne bar may also be helpful. They may not help as much in the unwinding process as much as they will help prevent abnormal sleeping postures that could perpetuate the deformity. Orthotics and gait plates may also be utilized to help to move the foot towards external rotation during gait. They are also beneficial in preventing abnormal compensation, which could put stress on the arch. Below is a clinical demonstration of in-toeing with the knee being held in rectus position by the clinician, the tibia lies in an internally rotated position causing the foot to follow by in-toeing. 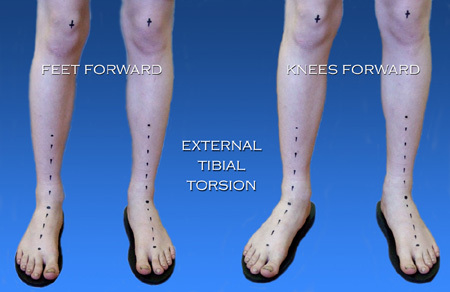 External tibial torsion is usually a common cause of an out toe gait. The lower leg bone (tibia) rotates excessively to the outside when comparing it to the upper leg bone (femur). Not usually due to in utero position as the fetus’ tibia is usually rotated internally. Tight ligament and tendon structures (hamstrings, iliotibial band). Can be caused by a true twist of the lower portion of the lower leg bone (tibia) relative to the upper portion of the lower leg bone (tibia). Commonly seen when children begin to walk. Becomes more apparent between the ages of 4 and 7. If the hip is normal the knee appears to be straight when watching the child walk but yet the foot and lower leg turn to the outside. Usually associated with a flatfoot deformity. Poor push off power during running. The child may lack coordination during activity. 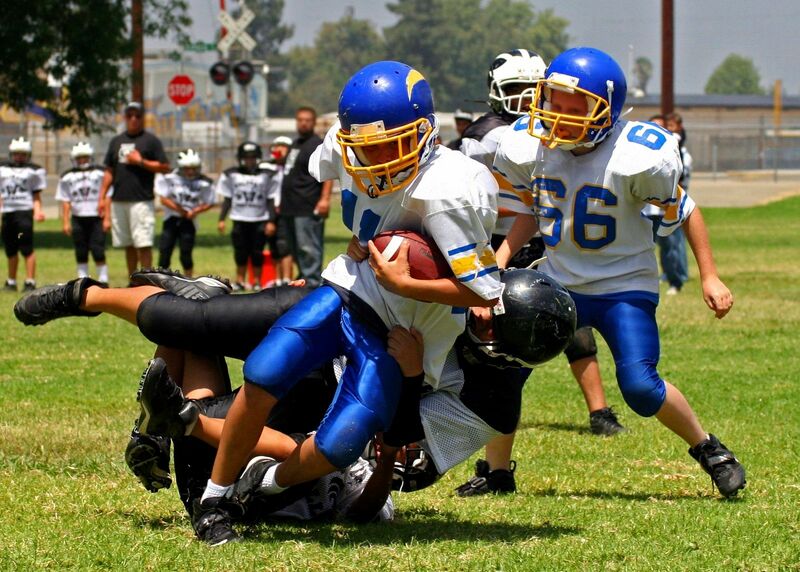 Runs poorly as the child runs through the midfoot and not over the ball of the foot as in a normal gait. Usually more commonly seen in one leg more than the other. Can be associated with knee Pain (patellofemoral instability). With the knee flexed at 90 degrees, the lower leg bone (tibia) is rotated in and out relative to the upper leg bone (femur). The tibia will rotate excessively towards the outside of the body and very little rotation will go towards the inside. Must also examine the hips for femoral retroversion (upper leg bone rotates excessively out with limited motion turning in). Must rule out flatfoot deformity which would be made worse by the lower leg position (external tibial torsion). If the deformity is significant x-rays may be taken. The lower leg bone (transmalleolar axis) is measured relative to the upper leg bone (bicondylar axis of the proximal tibia). In an adult, it is approximately 14 degrees external. Full lower extremity examination to rule out other coexisting problems. If the foot is flat orthotics are necessary for the foot to prevent the creation of or worsening of a flatfoot deformity. It will also help to bring the foot slightly up and in, lessening some of the appearances of the deformity. If associated with excessively tight ligaments and tendons around the knee a short course of immobilization in a cast above the knee may be of some benefit. When a cast is applied the lower leg bone (tibia) is gently rotated internally relative to the upper leg bone (femur). This causes a gentle stretch on the ligament and tendon structures around the knee area. 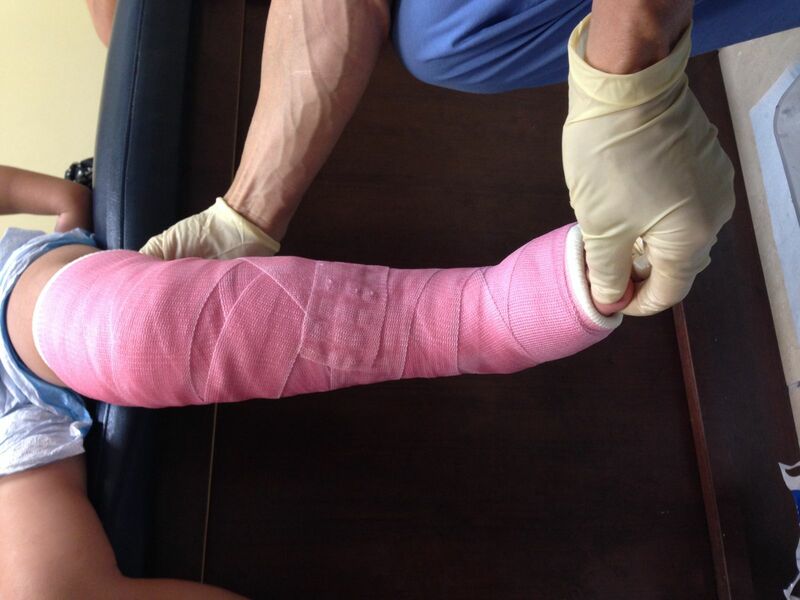 The cast may be necessary for up to 8 weeks depending on the degree of the problem. Following cast removal night splinting of the leg to hold the lower leg (tibia) in internal rotation relative to the upper leg (femur) may be of some benefit. If the condition causes problems with gait, pain in the knee or is of significant cosmetic concern, surgery can be performed at the lower leg (above the ankle growth plate) to take some of the rotation out of the lower leg bone (tibia). Surgery should not be performed until the child is 10 or older. Below is a casting technique used on smaller children to help stretch out soft tissue structures to allow rotation of the tibia to align the foot with the knee and femur.